Drowning is the third-highest cause of accidental death in New Zealand, and its unforgiving river waters claim an average of 32 people a year. But with essential knowledge, skills development and approved personal protective equipment, many of the risks associated with rivers and floodwaters can be greatly reduced. The Vector Wero Whitewater Park Rescue Programmes arerecommended for all people and personnel who operate around swift-water environments. 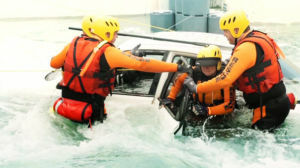 It has been designed to train personnel in staying safe around swift-moving water, to give basic self-safety and peer-safety strategies and rescue skills, and to help them recognise when they need assistance. 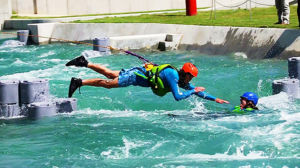 The programme is delivered at Vector Wero Whitewater Park, New Zealand’s first and only artificial white water facility. It is a highly controlled environment designed with the highest safety standards and best practices. The park attracts international clientele including the US military special forces and South Australian State Emergency Service. For bookings and enquiries, please call (09) 976 7777 or use the contact form.